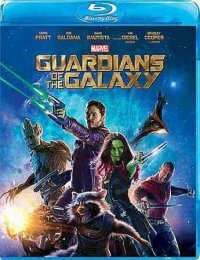 Special features: Guide to the Galaxy with James Gunn; The intergalactic visual effects for Guardians of the Galaxy; Exclusive look at Marvel's advengers; Gag reel; Deleted scenes with commentary by James Gunn; Audio commentary with James Gunn. Blu-ray; region A; anamorphic widescreen (2.40:1) presentation; 1080p high definition; DTS-HD Master Audio 7.1, Dolby Digital 5.1 surround sound. Out of this world submitted by echternk on June 16, 2015, 11:49am This movie is so much fun, you'll forget just how much of it ties into the rest of the Marvel Cinematic Universe. This movie stands very well on its own, but pay attention for the plot points! Fun submitted by samanthar on June 17, 2015, 11:12pm It's fun and enjoyable. I personally don't consider it among the top superhero movies, but it is lighthearted and fun to watch with others. Good submitted by AprilCDB on July 2, 2015, 2:12pm Previews didn't do much for me, but it was better than I expected. It was a decent movie to watch. A pretty Hysterical movie submitted by Kikumatsu97 on July 6, 2015, 1:24pm I love this cast! ! Already can't wait for two!one of the best things about this movie is the soundtrack! ! Had a bunch of oldies but goodies, the makeup and effects are awesome in this movie! Great movie submitted by leenajong on July 7, 2015, 6:04pm This is a fun movie with a sense of humor. One of the best movies in the MCU submitted by asopijw65 on July 15, 2015, 12:58pm I think this is one of the best movies in the Marvel Cinematic Universe! I think the only one better is Captain America Winter Soldier. The two movies have very different feels. Guardians of the Galaxy is a nice addition to the MCU as it is more funny than the other movies and does not take itself too seriously. Entertaining submitted by wendylv on July 20, 2015, 8:17pm This was a fun movie but probably more enjoyable if you are already familiar with the characters and backstory. Read your comic books, kids! Just Plain Fun! submitted by pamhockey25 on July 22, 2015, 10:36am I am not someone who is familiar at all with this series, and even with no background, this movie is fun and entertaining. I definitely will watch more of the series. Can't wait for the sequel submitted by JulieCraig on July 7, 2016, 6:20pm Marvel hits a home run with another exciting cartoon comic book come to life. Sci Fi and Fantasy enthusiasts will enjoy this movie. Can't wait for the sequel. Both my husband and I enjoyed it. great submitted by poptart887 on July 17, 2016, 10:56am i enjoyed this film very much. Fun submitted by dahyatt on August 7, 2016, 10:12pm This was a fun movie to watch. A nice change of pace from the seriousness of most super hero movies. Great Movie submitted by illy on August 31, 2016, 10:35am Of all of the MCU movies so far, this is my favorite. Fun submitted by yenkong on June 28, 2017, 1:49pm It is a fun movie to watch. A lot of humors. Fun submitted by hmarchan on July 6, 2017, 7:27pm Guardians of the galaxy is a very fun movie. Something my entire family watched with no problem. Incredibly Well Done submitted by JarrettB005 on June 18, 2018, 2:15pm I watched this with my family and it was very funny and a great addition to the Marvel canon! Second was great too. Fun submitted by VanCancue on June 22, 2018, 12:00pm It was so entertaining and funny! Guardians of the Galaxy submitted by SBNB on August 16, 2018, 9:47pm This was a good movie, better than I expected. Very sci-fi, but good. Good submitted by anacoluthon on August 21, 2018, 7:25pm This movie has an amazing 80s soundtrack, and is much goofier than a lot of superhero films.